I love creating pet portraits that go beyond the “headshot” and start to elicit something more personal to the pet parent and viewer, while also exemplifying my work as an artist. Discovering the ways to get creative with your pet images will require some exploration. Consider the following as you continue with your practice. Visually telling a story with your images is part of what makes photography such a powerful medium. The element of story can be incorporated into pet photography just as it can with any other genre of photography. 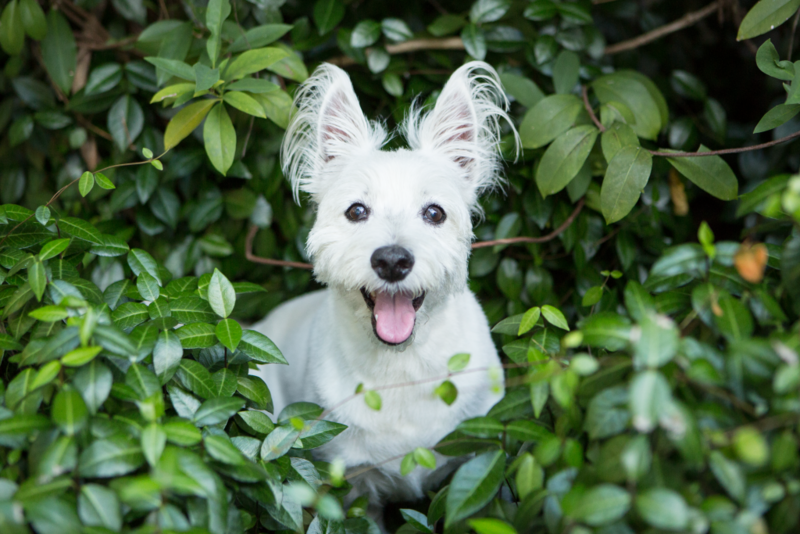 This dog loves to make tunnels as she runs through the greenery in her backyard. Photographing her in this space added an element of story to the image. As a pet photographer, you may choose to visually tell the story of a pet’s personality, their interests, their relationship with their pet parent or another pet in the family, a specific event or adventure, a special talent, or even their journey at the end of their life. 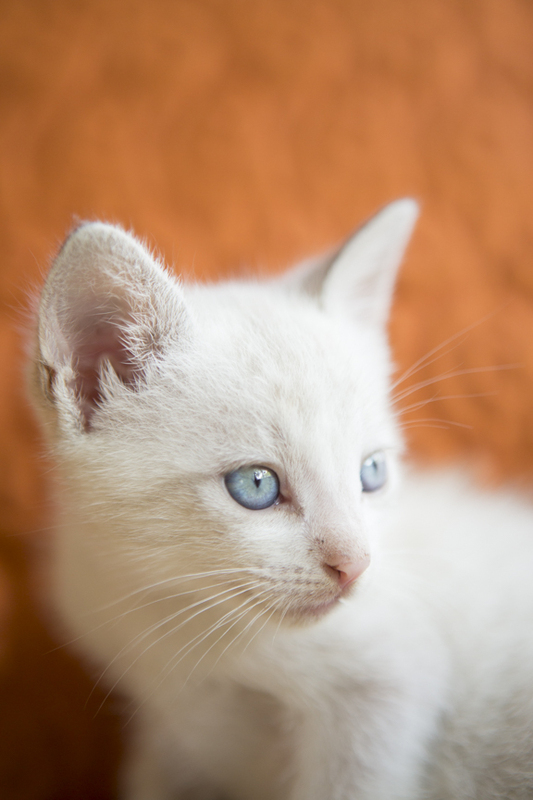 Perhaps you are photographing your own pet; if so, think about the story you’d like to tell about him or her. How can you tell that story visually, with your camera? Story can be conveyed in your pet portraits in many ways. Details like pet toys and beds can be sweet additions to create a reference for a viewer. Interior home environments or backyards can also serve as a reference point to a time and a physical space. Even when the environment is not very descriptive, the story you’re sharing with the viewer can be as simple and beautiful as a moment of connection between pet and owner. The story of your images doesn’t always need to be dramatic or deep. It can be all about honoring the grace of a horse, the beauty of a dog’s profile, or the sweet mischief of a kitten. The primary consideration when telling a story with your pet portraits is to be clear about the story you are trying to tell. This clarity will help you create more dynamic, authentic pet portraits. As I begin to photograph during a pet session, I may not initially feel inspired by the location, the light, or the colors in a scene. But I often notice that once I start, ideas and inspiration start to arise. 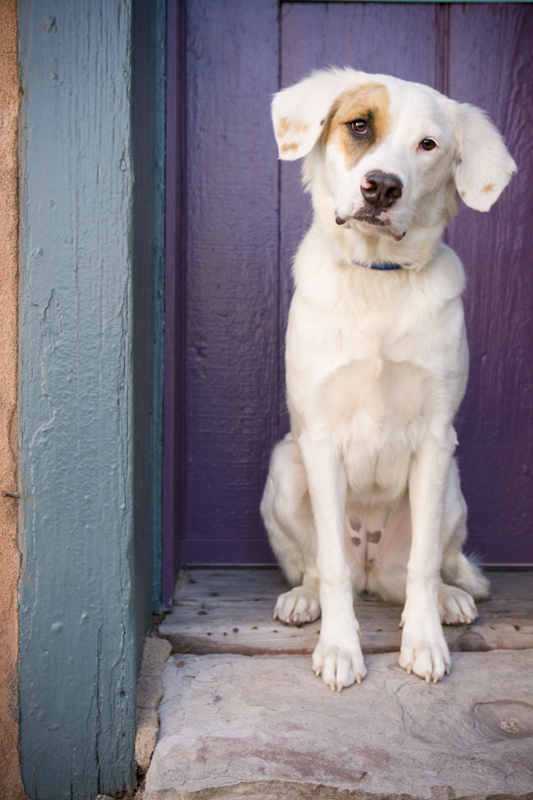 Be open to the possibility that inspiration for your pet photography can develop as you shoot. Pay attention as you are photographing to what’s working for you creatively and what could use a change. You can even pull together small elements that you feel are strong in your image and use them as a platform to build on. For example, maybe you notice a beam of light on one side of the dog against the wall, and as you continue to photograph, you create a series of images in which the light falls directly on the dog in a dramatic way. This is an example of something you may not have been able to plan before the session but that provided you with inspiration in the moment. The cascading light in this image offered inspiration to me during the photo session. Looking at other photographers’ images can be really helpful in generating ideas as you start to draw elements from multiple artists (pet photographers or any other kinds of photographers and artists, for that matter) to inspire you to create your own unique work. I like to use the phrase, “discovering your style,” with regard to pet photography, as opposed to “creating your style,” because I don’t think your authentic style as an artist can be forced or even generated on a conscious level. There are many pet photographers in the world—certainly many more than there were when I started in the genre many years ago. While some photographers may have a similar style to yours, no single pet photographer is exactly the same. You are the only one who can do what you do. 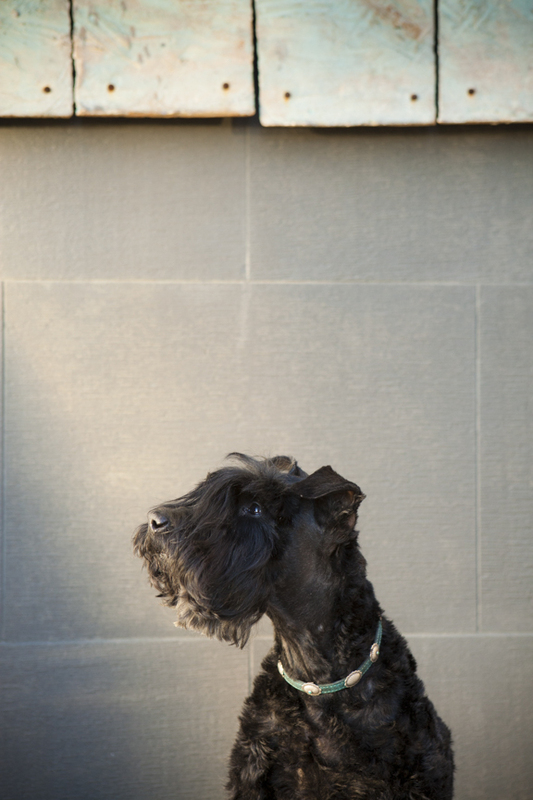 Build on what you love and on what lights a spark in you as you create pet portraits. Your style can and will evolve over time, just as you do. I’ve noticed that my tendency to create simple, clean images has remained fairly consistent throughout my years as a pet photographer, but my style and techniques have evolved. If you’ve already been working as a pet photographer and are looking for a “reset,” consider putting together a portfolio; creating or updating a website is an excellent way to reconnect creatively. This process is also a great opportunity to consider what you feel might be missing from your work or a new approach you’d like to explore. Your creative perspective or point of view as you’re making pet portraits can vary drastically, has no limitations, and is a direct representation of your style as a pet photographer. Your perspective is unique to you. My point of view has evolved slightly over time, but for the most part I tend to create contemporary, yet timeless, colorful and simple images of pets and their people. I consider myself a portrait photographer versus a documentary photographer, and in the last few years I have been more drawn to capturing the connection between people and their pets than I have in the past. Occasionally, I will create images with humorous qualities, take on a more documentary approach, or even create a dramatic feel to my work, but for the most part my point of view is to create images that evoke joy. HUMOROUS IMAGES of pets can be really fun to create. Perhaps these images involve silly props, or wide-angle lenses to exaggerate or distort physical features. Or maybe you use Photoshop to combine illustrations with your photographs. 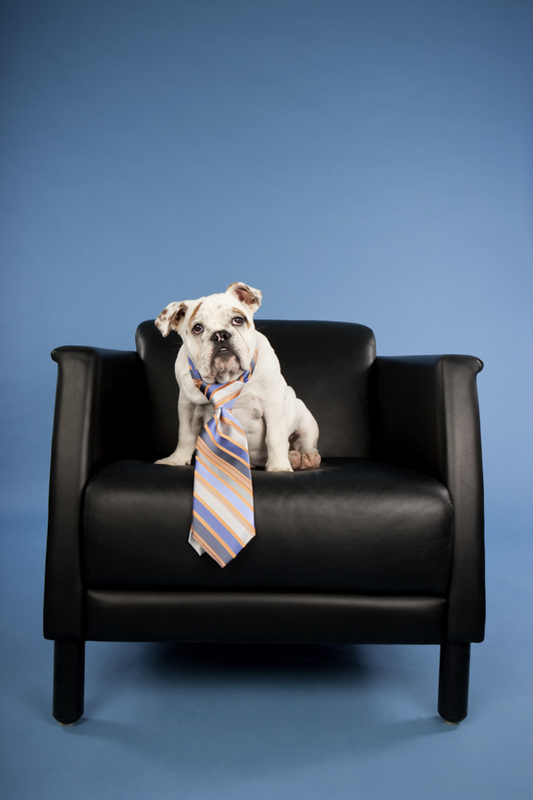 You might choose to create studio sets with pets and add humor or capture a pet in unusual settings or situations. DRAMATIC IMAGES can be more serious in nature. If you like to photograph in this way, you might enjoy more dramatic lighting, maybe even studio lighting. Black-and-white photographs of pets can often convey a sense of drama and emotion. The drama, whether created with light, location, or in postproduction, will directly impact the emotional response of the viewer. FINE ART IMAGES of pets might involve a specific style of lighting or a unique treatment in Photoshop or other postproduction technique (via printing or processing) that results in a final product. CONTEMPORARY OR MODERN PET PORTRAITURE will evolve over time, but this style currently involves creating portraits that have a lifestyle element to them. They are often created in modern-designed spaces, and usually feel fresh and clean in style. DOCUMENTARY-STYLE IMAGES, wherein you act as a “fly on the wall” creatively recording action and activity, can be quite beautiful. Moments captured without your presence being known to the pets can produce very interesting results. With a documentary approach, you can also shoot from the hip, literally. Many people prefer this way of working, and you may love the experience of photographing pets in this way. While the majority of this book does not focus on the documentary style, it is a completely valid way to create pet portraits. Pet photography can be hard work, but it is integral to your creativity that you are having fun on some level when you are creating. Sure, it can become overwhelming to consider all that is involved with regard to composition, color, and many other factors in a way that brings all the elements together in a final product. At the same time, this challenge can be very rewarding. The more awareness-based practice you have, the more quickly you’ll be able to make compositional decisions, and in time, you will develop your own creative style. Try your best to learn from what you’ve created, build on it, and enjoy the process. 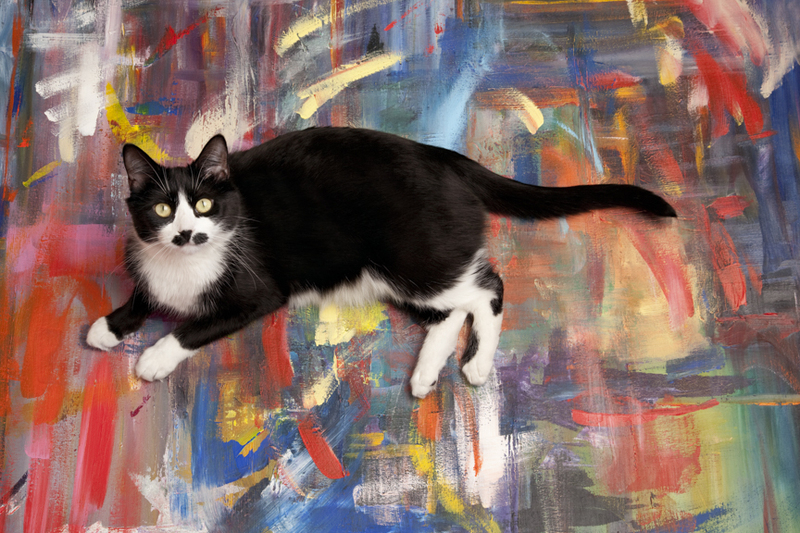 One of my acrylic paintings made for a fun, colorful background for this beautiful tuxedo cat.